Organized by the Agencia Española de Cooperación Internacional para el Desarrollo (AECID), FAO and the Parliamentary Front Against Hunger from Latin America and the Caribbean (PFH-LAC), this side event provided an opportunity for interaction among CFS partners, practitioners and other stakeholders to: exchange information and valuable lessons learned on parliamentarian initiatives to strengthen food security and nutrition (FSN) policies and resource allocation to end hunger and malnutrition; identify opportunities to increase interregional collaboration towards a global parliamentarian network, including the call for a global parliamentary summit to be held in Madrid in 2018; and discuss how to enlarge collaboration of CFS stakeholders with parliamentarians to achieve SDG2 and the progressive realization of the right to adequate food. Hon. Bernadette Lahai, President of the Pan-African Parliamentary Alliance for Food Security and Nutrition and Vice-President of the Pan-African Parliament. 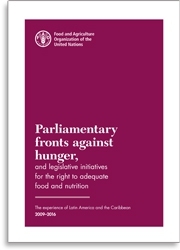 The event was also the occasion to launch the publication “Parliamentary Fronts against Hunger and Legislative Initiatives for The Right to Adequate Food and Nutrition: the Experience of Latin America and The Caribbean. 2009-2016”. The study presents the experience and activity of the PHFs and aims to provide structured, concise and relevant information about the legislative initiatives supported by the PFHs from 2009 to 2016.